“I have advance/decline data going back to 1970. Note the only failure occurred in 1987, a year in which the S&P was up sharply for 3 and 6 mts before crashing 10 months later under the pressure of rising interest rates. In his book Winning on Wall Street, Marty Zweig has an additional four listed from 1950-1969, that were 3-1 three months later and 4-0 six months later. Also note that this is the second thrust this year. The two other calendar years that I have with two occurring are 1975 and 1982 (in bold) and both were very positive. The concept is that market rallies are similar to rocket launches. Without the proper momentum they will not have the strength to leave the earths atmosphere. 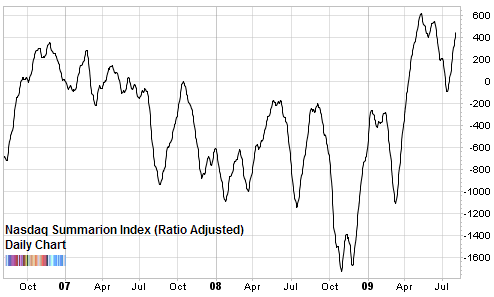 One way to measure the strength is a measure of broad participation via the A/D line over say a 10 day period. 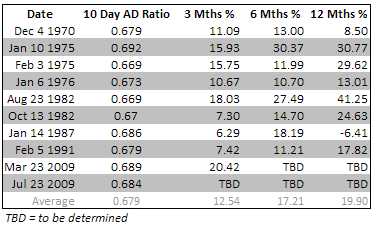 If the A/D over a 10 day period can achieve a level close of 2 (actually about 1.91 is the optimum level), then history suggest that there the market has the strength to sustain a meaningful rally. Also, with today’s close we had 91% of the S&P 500 index components trading above their 200 day simple moving average. That is the highest for at least 5 years! 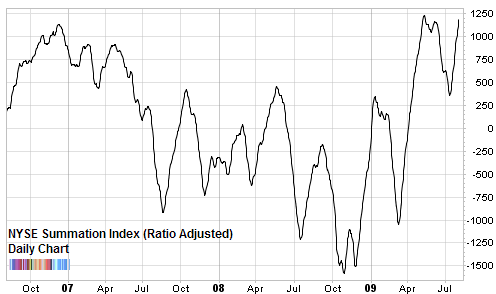 The last time this indicator was this high was in late February 2007 - when the Standard & Poor’s 500 was trading at 1460. Just to clarify, is the conclusion of your analysis that stock prices will continue rising because they’ve been rising? Rob, no. The conclusion is that we are seeing a rare extremely powerful thrust which has historically presaged a prolonged uptrend. Interesting. According to our data, Wayne missed a signal in 1985 (jan 22nd) that worked, and a signal in 1992 (jan 6) that did not. Furthermore, we cant figure out how he’s computing the returns. It is not stated when the returns are on the SPX or NYSE composite. Let’s assume the latter. The signal triggers at close of business on monday march 23. Assuming execution at the monday closing level on the morning of the 24th, and holding through june 23, the NYSE is up 12%. The only way to get 20% is to include Monday the 23 when the NYSE was up 7%, which assumes you exeute monday morning without knowing that the signal triggers at close of business on the same day. So its not clear how the numbers actually work. Advance decline 2/1 calculations are on NYSE data which is what most analyst use for breadth and A/D analysis. The following % changes are on S&P data, because that is what I trade and I have closing day price data on. Many analyst do similar analysis on other indexes that are informative as well. For example you had many 2/1s on Nasdaq in the 90s that you didn’t get on the NYSE. Some analyst with the research staff will actually go to the trouble of taking out the preferred stocks and such. I have the 10 day AD line on Jan 22, 1985 at 1.95 and on Jan 6 1992 at 1.97 It could be data entry or different data providers but I notice that my numbers are same as another report I have seen on the subject. There’s nothing magic about 2/1, it just makes for easier story. The 1.95’s are decent as well. Pick out whatever works for you. The 3 month forward performance was actually a 63 forward trading days performance and I should have labeled as such. Similarly the 6 month was 126 days and the forward 12 months was 252 days. Over the last 20 years, most calendar years have 250-253 trading days in them. Exception would be 2001 when we shut down for a week.